At a time of rapid global change, development NGOs are having to scale up their impact, diversify their activities, respond to long-term crises and improve their performance on all fronts. 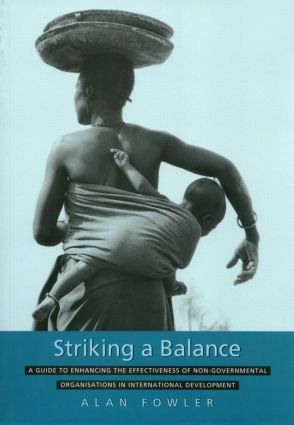 Striking a Balance offers both analysis and a practical guide to how NGDOs can fulfil these demanding expectations. Written for all those involved with NGDO work, the book describes the objectives of sustainablepeople-centred development and the process required to achieve it, focusing on the five factors which determine effectiveness: suitable organisational design; competent leadership and human resources; appropriate external relationships; mobilisation of high quality finance; and the measurement of performance coupled to 'learning for leverage'. In each are the book explains the capacities needed and how they can be assessed and improved. Effectiveness calls for NGDOs which retain their non-profit values, establish the right type of Professionalism, manage dilemmas and balance choices to continually reflect the priorities, rights and needs of those who give them legitimacy: people who are poor and marginalised. This book provides a reference of current and future practices which will help NGDOs to do so.